"Burritoville, a local joint down by Southeast University here, specializes in some of the oddest burritos I've ever tasted. From the BBQ chicken to the Buffalo burrito, I've had them all, but they've got only one type of quesadilla. So I've decided to take one of my favorite burritos from there, the cheeseburger burrito and apply it to quesadilla form. Served with a side of fries and a Coke®, it's what I call my most recent of culinary triumphs. Serve with a side of ketchup, yellow mustard, and sweet relish." Heat butter in a saucepan over medium heat; cook and stir onion until slightly tender, about 5 minutes. Add ground beef, Worcestershire sauce, salt, black pepper, and garlic powder; cook and stir until beef is browned and crumbly, about 10 minutes. Remove from heat, drain liquid from beef, and let sit for 2 minutes. Heat a griddle or flat pan over medium heat and spray with cooking spray. Place 1 tortilla on the hot griddle, top with some of the Colby cheese, 1/4 of the beef mixture, 1 teaspoon ketchup, 1 teaspoon mustard, and 1 teaspoon relish. Top with more Colby cheese and 1 tortilla. Flatten the quesadilla with your hand. 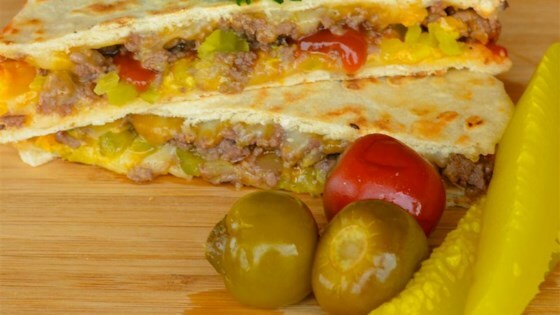 Flip quesadilla with a spatula and cook until browned and cheese is melted, 3 to 5 minutes more. Cut quesadilla into 4 pieces. Repeat with remaining tortillas, ground beef, cheese, ketchup, mustard, and relish. My family didn't really like this recipe too much. There were too many flavors that didn't flatter each other. Fun, easy and delicious. Everybody loved them. These were sooooo good! My family loved them! Will pass this recipe along to my friends! For being a kid type food, my husband and I liked these the best. Next time I will let the kids choose there own condiments. We will making these again.